We understand that losing a loved one is a difficult time and you may need a helping hand to provide the right Funeral flowers. 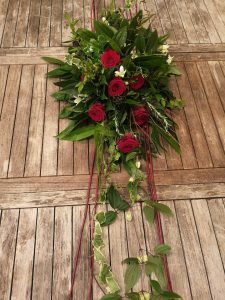 Funeral tributes can be a unique way to remember a loved one and you can trust Chez Fleur to provide a fitting display. We offer beautiful hand tied sprays and other unique foam free (no Oasis floral foam) designs which are totally environmentally friendly. You can also incorporate your choice of flowers – and for a personal touch it is a lovely addition when we can include flowers from the deceased’s garden. Chez Fleur can supply images upon request – out of respect for our clients we do not post photos of actual funeral work on the website but the photo below illustrates a typical foam free biodegradable tribute suitable for a coffin.